Affordable Luxury DOES Live In Ashland. The award-winning, best-selling Acura SUV – the MDX – arrives and leaves as quick as they come off the truck! The first shipment arrived this month and the newly minted 2016 Acura MDX has a plethora of innovative upgrades, in fact doubling from the 2015 to the 2016 model. The most significant upgrades relate to the powertrain and safety of the vehicle. 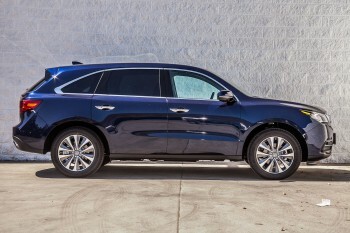 The 2016 Acura MDX received an updated powertrain with a revised all-wheel-drive system and a new nine-speed automatic transmission featuring a push-button gear selector. The new safety features are now bundled into an available AcuraWatch™ package that Acura adds to its family of trim levels: MDX with Technology Package, MDX with Rear Entertainment System, etc. AcuraWatch™ separates advanced safety features available for 2015 into a package and adds a few new ones such as Road Departure Mitigation and rear cross-traffic alert. The new nine-speed automatic transmission (which replaces the previous six-speed automatic transmission) is 66 pounds lighter and enhances acceleration performance with more closely spaced gears plus 25 percent faster shift times, according to Acura. Another innovative change is the replacement of the traditional column-mounted gear selector with the handy new push-button gear selector where Park, Neutral and Drive are engaged with the push of a button. Reverse is selected by a separate control. 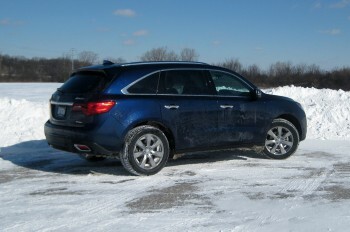 The beautiful MDX’s all-wheel-drive system is also upgraded and now uses Acura’s next-generation Super Handling All-Wheel Drive. The revised system is 19 pounds lighter and has an increased torque vectoring response for amplified turning. What IS torque vectoring you may ask? Torque vectoring creates rotation movement by changing wheel speed and can create more responsive handling. Acura says the torque-vectoring responsiveness has been enhanced to benefit agility and stability. These next-generation vehicles are here in Ashland for you to see. « First Open House of the Year a Success!